Carotid endarterectomy is an operation during which your vascular surgeon removes the inner lining of your carotid artery if it has become thickened or damaged. This procedure eliminates a substance called plaque from your artery and can restore blood flow. As you age, plaque can build up in the walls of your arteries. Cholesterol, calcium, and fibrous tissue make up this plaque. As more plaque builds up, your arteries narrow and stiffen. This process is called atherosclerosis, or hardening of the arteries. Eventually, enough plaque builds up to reduce blood flow through your carotid arteries, or to cause irregularities in the normally smooth inner walls of the arteries. Your carotid arteries are located on each side of your neck and extend from your aorta in your chest to enter the base of your skull. These important arteries supply blood to your brain. 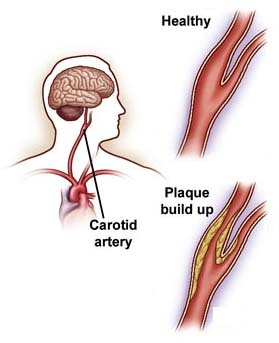 Carotid artery disease is a serious issue because clots can form on the plaque. Plaque or clots can also break loose and travel to the brain. If a clot or plaque blocks the blood flow to your brain sufficiently, it can cause an ischemic stroke, which can cause permanent brain damage, or death, if a large enough area of the brain is affected. If a clot or plaque blocks only a tiny artery in the brain, it may cause a transient ischemic attack (TIA), also known as a mini-stroke. A TIA is often a warning sign that a stroke may occur in the near future, and it should be a signal to seek treatment soon, before a stroke occurs. To remove plaque in your carotid arteries and help prevent a stroke, your physician may recommend a carotid endarterectomy. Carotid endarterectomy is one of the most commonly performed vascular operations, and is a safe and long-lasting treatment. Your physician or vascular surgeon will give you the instructions you need to follow before the surgery, such as fasting. Am I eligible for carotid endarterectomy? Am I at risk for complications during a carotid endarterectomy? What happens during a carotid endarterectomy? You may either be put to sleep or, alternatively, your anesthesiologist or surgeon can numb your neck area and keep you awake so you can communicate with the surgeon during the operation. By staying awake, you may help your physician monitor your brain's reaction to the decreased blood supply. Once you are either asleep or the area around your neck is completely numb, your surgeon will shave the skin on your neck where he or she is going to make an incision, to help prevent infections. Your surgeon then makes the incision on one side of your neck to expose your blocked carotid artery. Next, your surgeon temporarily clamps your carotid artery to stop blood from flowing through it. During the procedure, your brain receives blood from the carotid artery on the other side of your neck. Alternatively, your surgeon can insert a shunt to detour the blood around the artery that is being repaired. 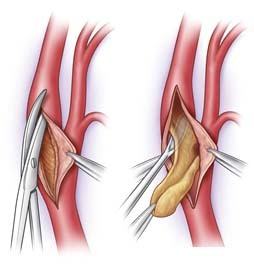 After your surgeon clamps your carotid artery, he or she makes an incision directly into the blocked section. Next, your surgeon peels out the plaque deposit by removing the inner lining of the diseased section of your artery containing the plaque. After removing the plaque, your surgeon stitches your artery, removes the clamps or the bypass, and stops any bleeding. He or she then closes your neck incision and the procedure is complete. Often, a patch is used to widen the artery as part of the procedure. The patch material used can be your own vein, usually from the leg, or a variety of synthetic materials depending upon your particular circumstance. The procedure takes about 2 hours to perform but may seem slightly longer depending upon the anesthetic and preparation time. What can I expect after a carotid endarterectomy? After surgery, you may stay in the hospital for 1 to 2 days. During this time, your physician will monitor your progress. Initially, during your recovery, you will receive fluid and nutrients through a small, thin tube called an intravenous (IV) catheter. Because the neck incision is so small, you may not feel significant pain. After you go home, your physician may recommend that you avoid driving and limit physical activities for several weeks. You can usually begin normal activities again several weeks after the operation. If you notice any change in brain function, severe headaches, or swelling in your neck, you should contact your physician immediately. You may have complications following any surgical procedure. 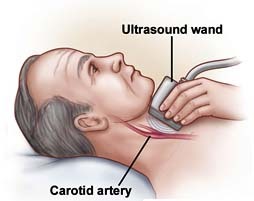 A stroke is one possible complication following a carotid endarterectomy. This risk is very low, ranging between 1 and 3 percent. Another unusual complication is the re-blockage of the carotid artery, called restenosis, which may occur later, especially if you continue to smoke cigarettes. The chance of developing a restenosis severe enough to require another carotid endarterectomy is usually about 2 to 3 percent. Temporary nerve injury, leading to hoarseness, difficulty with swallowing, or numbness in your face or tongue, is another uncommon, but possible, complication. This usually clears up in less than 1 month and usually doesn't require any treatment. However, the chance of any of these unusual complications is much less than the risk of stroke if a significant carotid blockage is not adequately treated.